I never thought I'd say this about a blue ink, but this ink is quite amazing. I'm really not much of a blue fan, especially royal blue inks never really do much for me. As a result, I use black almost exclusively as my go-to daily use inks (mostly Lamy black because it's cheap and well-behaved). But every now and then I get the urge to buy blue inks. 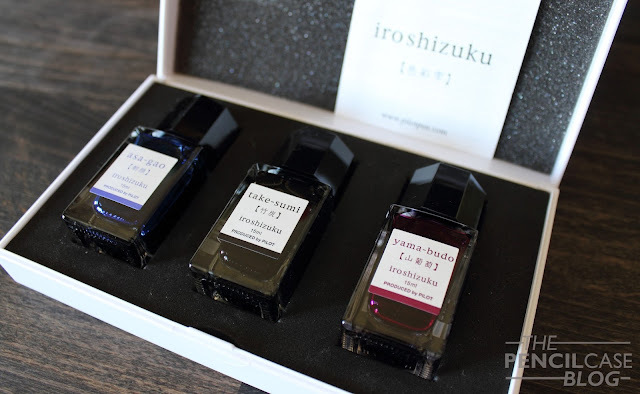 I bought this three-pack of 15ml Iroshizuku bottles from Penworld when I visited their store a few months ago. I thought it looked quite neat, and it had two inks in it that I really wanted to give a go (Take-Sumi black and Yama-budo magenta). It also had Asa-Gao in it, but I considered that an extra... until I came home and swabbed them! Asa-Gao is anything but a boring royal blue. I'd describe it as a cross-over between a typical royal blue and a bright turquoise blue like Sailor Jentle Souten or Iroshizuku Kon-Peki. Asa-Gao is considerably more saturated than most regular blue inks, and it balances slightly to a more turquoise hue. It's without a doubt one of the brightest and most saturated blue inks I have used so far, which makes it -in my opinion- infinitely better than regular royal blue inks that are often rather unsaturated and bland. A similar color would be P.W.Akkerman Binnenhof Blues, which leans more towards royal blue where Asa-Gao has a hint of turquoise in it. Diamine Blue velvet, one of my more recent discoveries, is perhaps an even better match, only a little less vibrant. 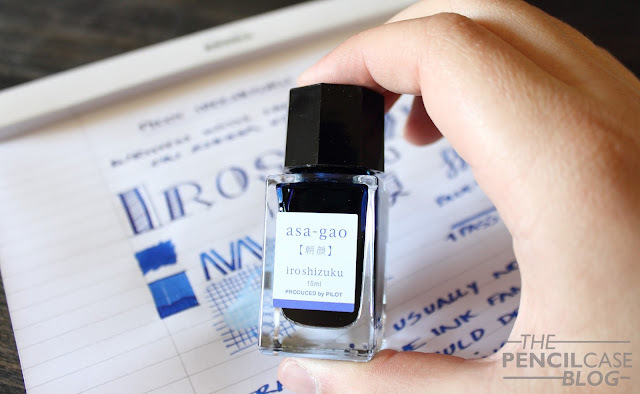 Next to Iroshizuku Kon Peki (reviewed HERE), you can see that Kon-Peki is actually turquoise with a hint of blue in it, the opposite of Asa-Gao. 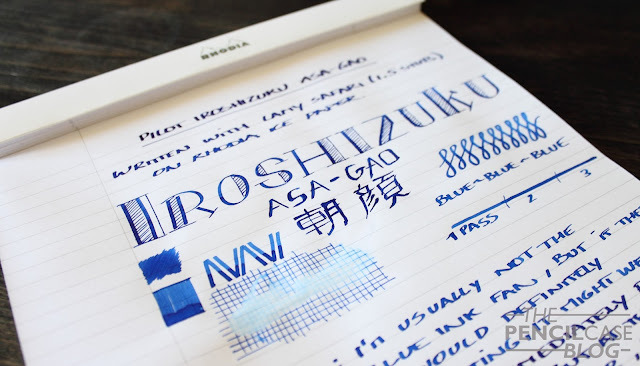 Performance is as you'd expect from an Iroshizuku ink. Flow is definitely on the wet side, which could make for slightly longer dry times in certain nibs and on certain papers. It's well-behaved as far as I know, and it has a very decent amount of shading. Most noticeable is the strong red sheen, which seems to be a common factor with a lot of blue inks, and for me it's one of the major selling points of this ink. Iroshizuku inks are expensive. Ridiculously expensive even! I haven't bought a full bottle in a year or so, which is a shame because they have some stunning colors, like Asa-Gao. The mini bottles are a decent solution if you want to give a certain color a go, but don't feel like committing to a full bottle. But on the flipside, you'll eventually end up needing more because these small bottles are only 15ml. I haven't seen these bottles for sale individually here in Europe, but in the US you can find shops that sell them per bottle for 14 USD a piece. A set of three will set you back 33USD, but you can't always choose which three colors you want, so you could end up with doubles. Note: Penworld Supports this blog. I received a discount on this purchase, so I could write this review. I was in no way influenced in the making of this review, the opinions shared here are completely my own. This review does not contain any affilate links.